« Q. WHAT DO YOU CALL A STATION WITHOUT AN ACCESSIBLE COFFEE SHOP? SNTB have to announce that after months of secret negotiations, Sepp Blatter was due to open ‘Picklesfest16’ on March 27th next year; the festival commemorating 50 years since local hero Pickles, found the World Cup in South Norwood. 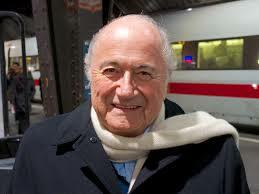 The FIFA chairman would have been a star speaker and a major catch for SNTB. We are gutted this has happened, but maybe it was the hand of god, so now we are chasing Diego Maradonna. Just had Jack Warner on the phone. Is it true that the FBI are investigating the awarding of the 2016 Picklesfest to south norwood? Would the president of the SNTB like to explain why he was seen with an “unknown elderly man from Switzerland” by the clock tower last year handing over a brown paper envelope with an estimated £10million inside?